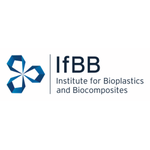 The IfBB – Institute for Bioplastics and Biocomposites was established in 2011 with the support of the Hochschule Hannover – University of Applied Sciences and Arts, as an autonomous institute within the university, following several years of increasing research activities. The purpose of the IfBB is to respond to the growing demand for complex information related to the field of bioplastics and biocomposites. IfBB research activities mainly focus on the development, processing and industrial usage of bioplastics and biocomposites. From the onset, the IfBB has been increasingly involved in industry projects and by now is widely acknowledged as an expert institution and resource center for bioplastics on a national as well as international level. The IfBB is not only concerned to engage in science and research, but also to provide professional training to students and to enhance their education. Partnerships on national, european or international scale for R&D or industrial projects concerning developement, utilization and recycling of bioplastics and biocomposites or hybrid composites.